Chicago toymaker Halsam was founded in 1917 by Harold Elliot and Sam Goss, Jr. (creating the company name by combining their first names ... HAL+SAM). It was a family business ... Harold was married to Hazel Goss (Sam's sister) and also managed the Goss Printing Press Company, inventors and manufacturers of the rotary printing press. 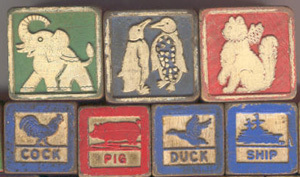 The Halsam factory was located at 1417 Ravenswood, Chicago, Illinois and produced embossed wooden toys and games ... primarily alphabet blocks, checkers and domino sets. 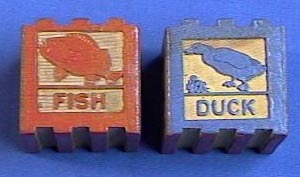 They received several patents for their block products, including the block sets with rounded corners, which they marketed as "safety blocks." 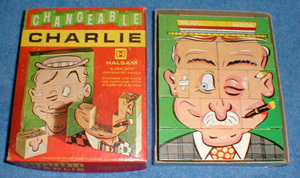 The company later developed new products, such as Hi-Lo blocks, American Bricks, Frontier Logs a variation of Lincoln Logs), Notchies, Aeroplay Contruction Blocks, Color Cubes (by acquiring their rival The Embossing Company), and a rotating block face puzzle called Changeable Charlie (acquired through their purchase of Gaston Manufacturing). Halsam was also one of the very first toy companies to license Disney characters (Donald Duck, Mickey Mouse) for their toys. 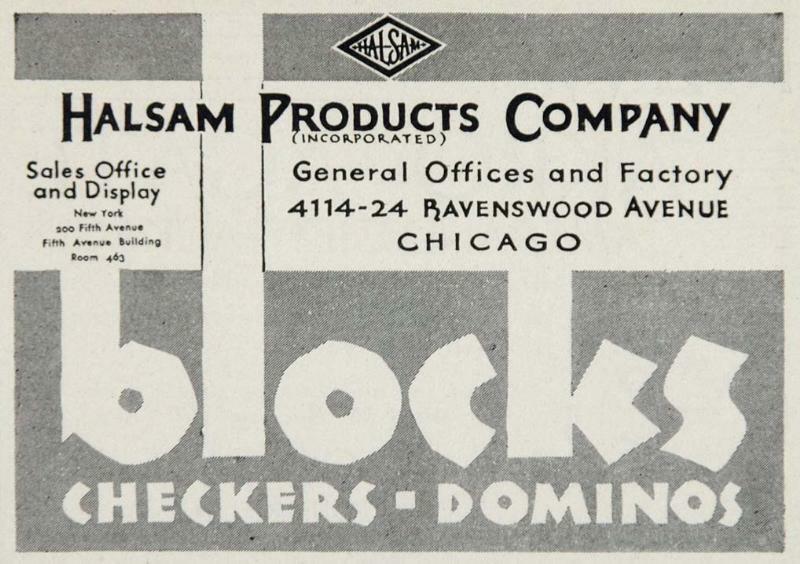 Halsam had a sister company called Elgo ("ELliot+GOss") which produced bakelite dominoes and checkers. 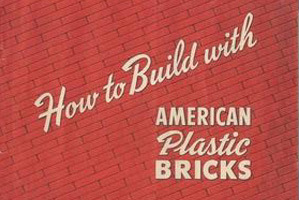 Elgo was established to utilize plastic-injection molding technology for toymaking, specifically a plastic version of their American Bricks, now called American Plastic Bricks. The Danish company Lego later introduced a competing product to Halsam's into the United States by purchasing Halsam's agreement not to contest such a similar product. 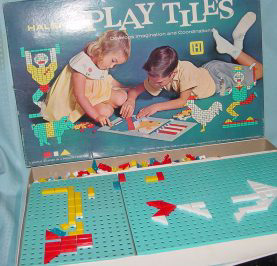 Other popular Halsam/Elgo toys included the Constructioneer and PlayTiles sets. In 1962, Halsam was purchased by Playskool (who later were absorbed by to Milton Bradley, which was ultimately acquired by Hasbro). The Halsam brand remained active for a few years after Playskool assumed control. 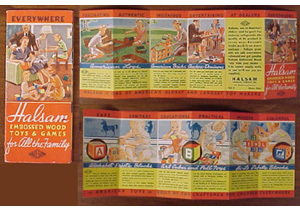 Halsam Toys have remained collectible over the years, especially the architectural toys such as American Bricks and Frontier Logs. This company spanned a nearly 50 year period from the dawn of the Golden Age of Toys to the arrival mass merchandising big box retailers. Along the way, they innovated the manufacture of toys through automation and toy marketing through a variety of channels. Copyright 2009 Scott Bultman. All rights reserved. No other use of this history is permitted without expressed written permission from the author.